This CellML version of the model has been checked in both OpenCell and COR and it runs to recreate the published results. The units have been checked and they balance. ABSTRACT: The pacemaker activity of the S-A node cell was explained by reconstructing the pacemaker potential using a Hodgkin-Huxley type mathematical model which was based on the reported voltage clamp data. In this model four dynamic currents, the sodium current iNa, the slow inward current, is, the potassium current, iK, and the hyperpolarization-activated current, ih, in addition to a time-dependent leak current, i1 were included. The model simulated the spontaneous action potential the current voltage relationship, and the voltage clamp experiment in normal Tyrode solution of the rabbit S-A node. 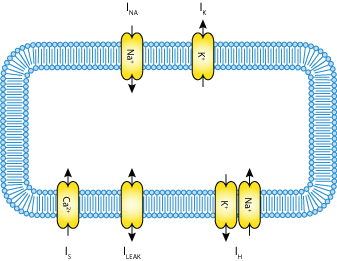 Furthermore, the changes of activity induced by the potassium current blocker Ba2+, by applying constant current, acetylcholine, and epinephrine were also reconstructed. It was strongly suggested that the pacemaker depolarization in the S-A node cell is mainly due to a gradual increase of iS during diastole, and that the contribution of iK is much less compared to the potassium current iK2 in the Purkinje fiber pacemaker depolarization. The rising phase of the action potential was due to iS and the plateau phase is determined by both the inactivation of iS and activation of iK. A schematic diagram describing the sinoatrial node model. Derived from workspace Yanagihara 1980 at changeset 17c2f541f211.